Is the future of fantasy sports finally here? There are two types of sports fans out there currently watching MMA (mixed martial arts), those who want to be in that cage, and those who deny wanting to be in that cage. Regardless, of size, ethnicity and gender MMA seems to have a special place in the hearts of sports fans internationally. Relatively new to the fantasy sports scene in comparison to the big four fantasy sport predominantly played fantasy MMA has gained significant steam and continues to increase market share globally. Experts believe that fantasy MMA has the potential to surpass fantasy football with its global appeal and year round event schedule. With no seasonal restrictions fantasy MMA can be enjoyed by its 300 million strong fan base all the time. Investors are all in on the sport already and the fantasy version is no different. Everyone is ready and willing to go all in on a sport with a bigger fan base than baseball while also being extremely entertaining to watch. No need to worry if you can’t step in that cage gamers, fantasy MMA is large and in charge in the market and will soon have a place at the table with the big boys. Don’t pass up the opportunity to beat down your opponent figuratively with your fantasy MMA line up. Fantasy MMA is the most straight forward fantasy sport in existence and allows the player to choose which combatants they want to win at a given event. For example if the event has 10 matches, the fantasy MMA player will pick the winner, method and round by which each fighter for all 10 fights will win. Naturally different leagues have different scoring systems, but at the end of the day the fan gets to choose which MMA athletes they will pull for at a given event. Fantasy MMA has two primary and intriguing ways to play. Both keep the player engaged in the matches for the duration of the event maximizing the entertainment value. In one format, the fantasy gamer will pick a winner in each fight, the method they will win by and which round they will in. Points will only be awarded in matchups where the gamer chooses the correct winner. Then the gamer will assign confidence values to each of their picks 10 through 1 in a 10 match event. If they are certain about a given matchup they will choose 10 as their confidence level for that fight, and if they have no clue who’s going to win, they would assign a lower value. In another format gamers will be given a 50K budget and will be able to bid auction style on the player they want on their 5 man roster. After they assemble their team the 5 fighters that they purchased will be awarded points for their performance throughout the fight. Scoring may vary but traditionally teams get points when fighters on that team score clean punches, knockouts, take downs, submissions, reversals and duration of fight. At the end the player who’s team of 5 fighters accumulated the most points wins. 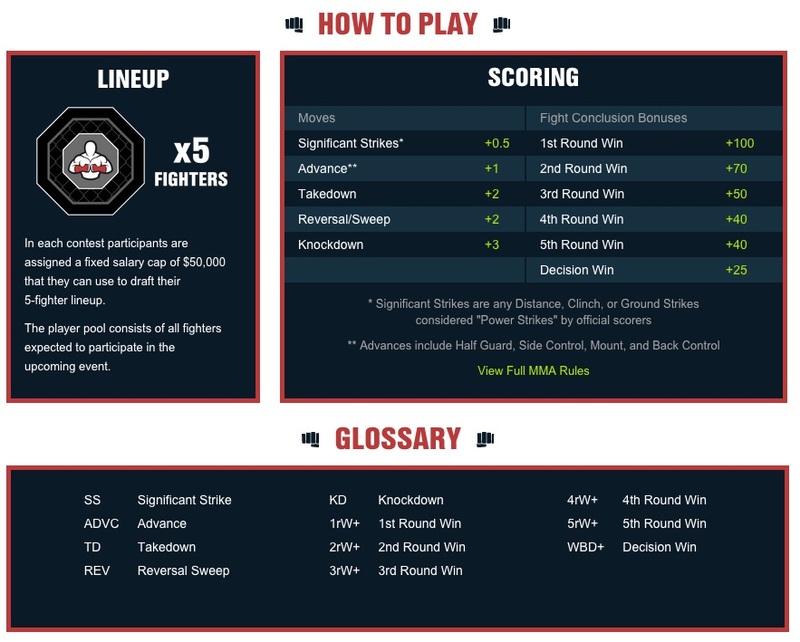 There are 3 major sites that offer fantasy MMA, all of which bring a slight variance to how the game is played and scored. One of the current leaders in daily fantasy sports leagues is DraftKings who offers their customers the opportunity to join leagues, purchase players and compete for a cash reward. Another site kountermove.com allows you to construct your team in a similar way but the site as a whole only offers gaming options in combat sports. Thirdly, fantasymmahq.com is a site committed only to MMA sports and they do it like a boss. In this format you assign confidence values to your picks, but also score points for predicting the knockout methods and round the fight ended in. All three sites are thriving and offer the chance to win money. It’s easy to get into MMA the sport. It’s fast paced, entertaining and appeals to the masses. This is precisely the reason fantasy MMA will become popular as well amongst gamers and fans alike, and hopefully you can find your own way to “strike” while the iron’s hot.